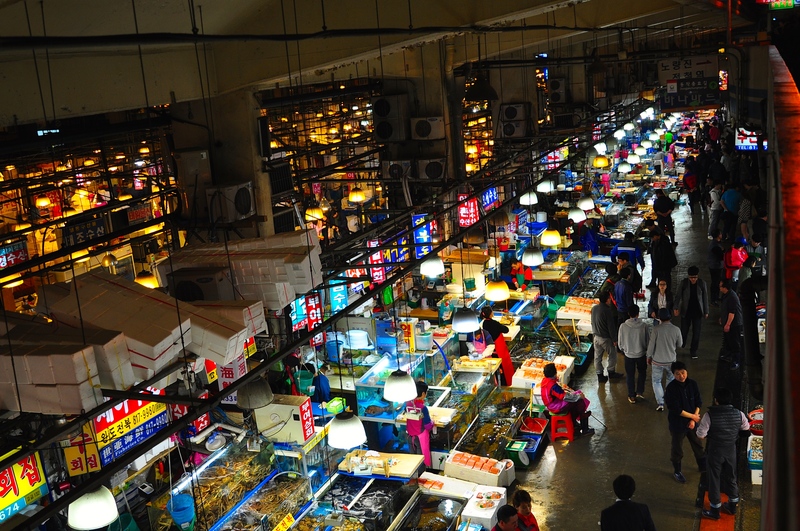 After four days of web stuff and dinners, I break away on the final evening to seek out my place of venality – a fish market . Not for me the throb of the night club nor the slurp of the bordello. I crave the smell of wet seafood. Seoul does not disappoint. I get there at 8:00 pm and the place is hopping. 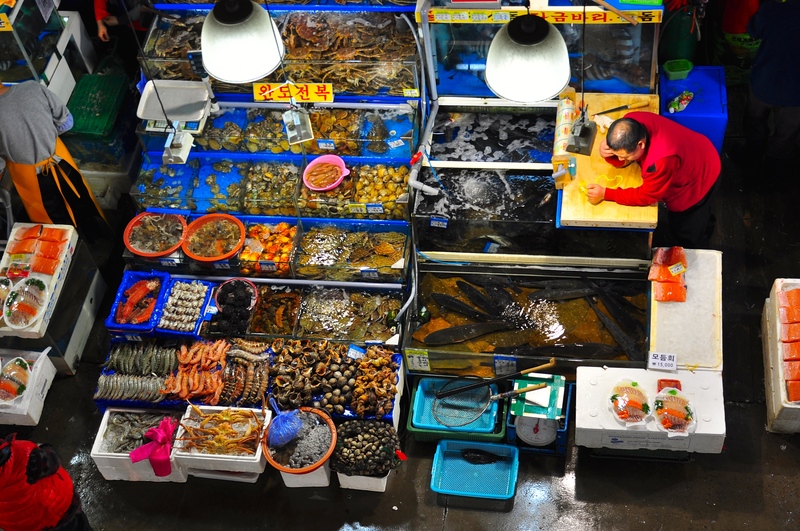 There is about a square hectosievert of fish stalls, all selling very fresh, er like alive, fish and sea food. I am bedazzled. I stroll around looking at stuff with the idea of going to a restaurant for a light supper. It becomes clear that going to a restaurant empty-handed is a cop-out. 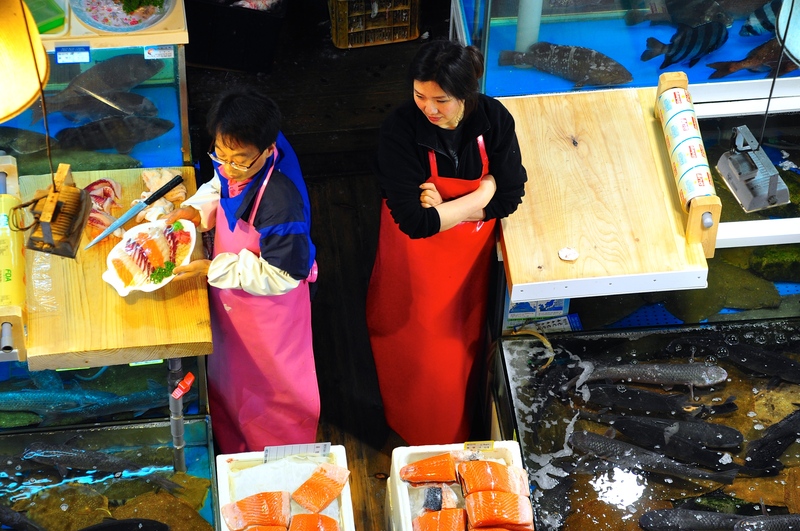 You buy the fish at the market and then take it to the restaurant where they then cook it for you. I am inebriated. She is right, it is remarkably cheap. Off I go through strange passages, slaps and stiles until I come to a restaurant. They grab the lobster and sit me down on the floor. 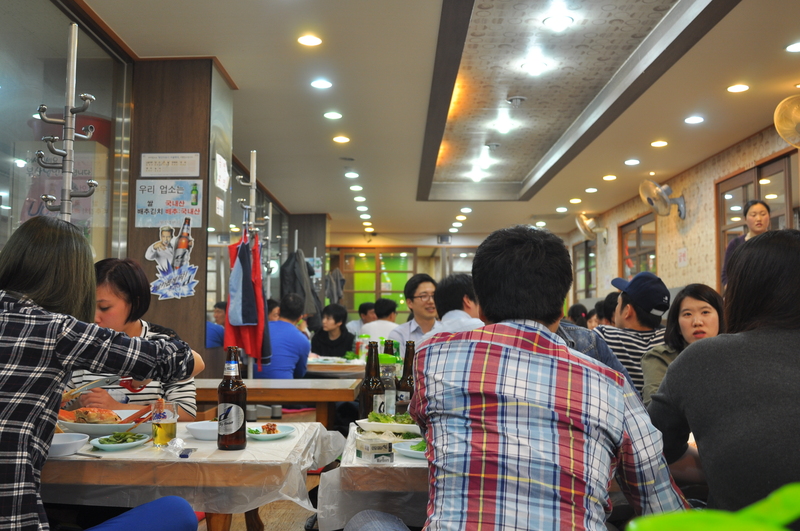 This is only one of a dozen or so places that are full of Koreans having a REALLY good time. 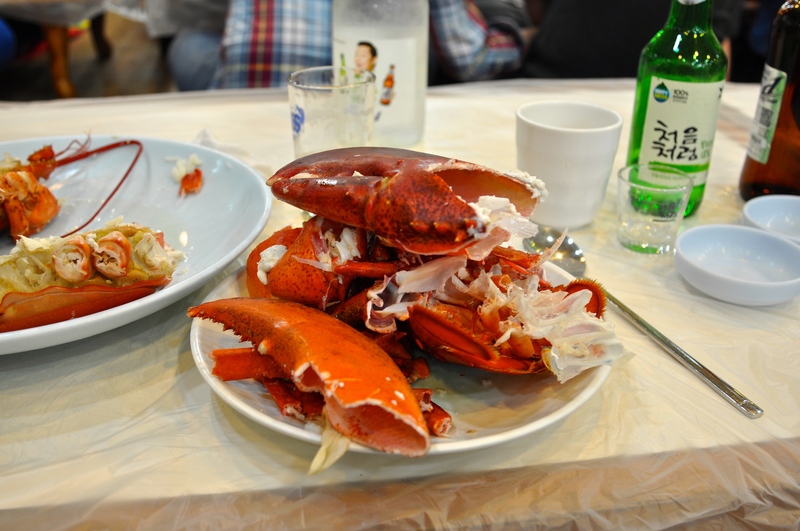 They are gobbling down the best seafood and guzzling shochu. These places are raucous. They are very welcoming to me and we discuss football as best we can. Was Gareth Bale worth the money? 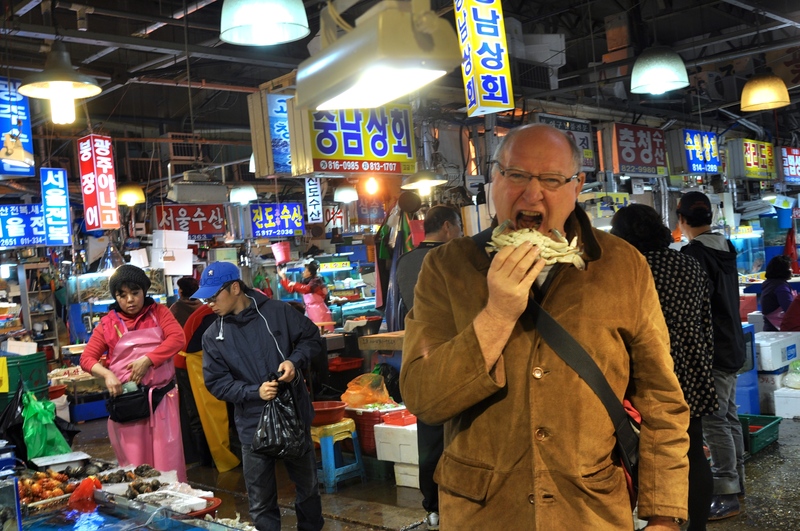 Asia is the place to eat fish. 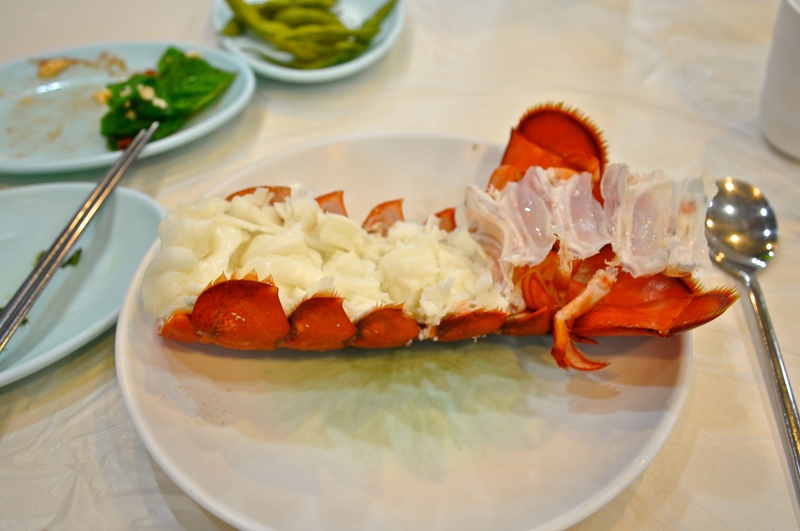 This entry was posted in Uncategorized and tagged Bordello, fish, Lobster, Seoul. Bookmark the permalink. I ate a parrotfish in Muscat. I still feel guilty – it was so beautiful. It was dead though. What a surprise. Love to write something but can I get a couple of Dileas adventures under the belt first? Sailing in Typhoon, eaten by Parrot Fish sort of thing. I could deliver July, August-ish. 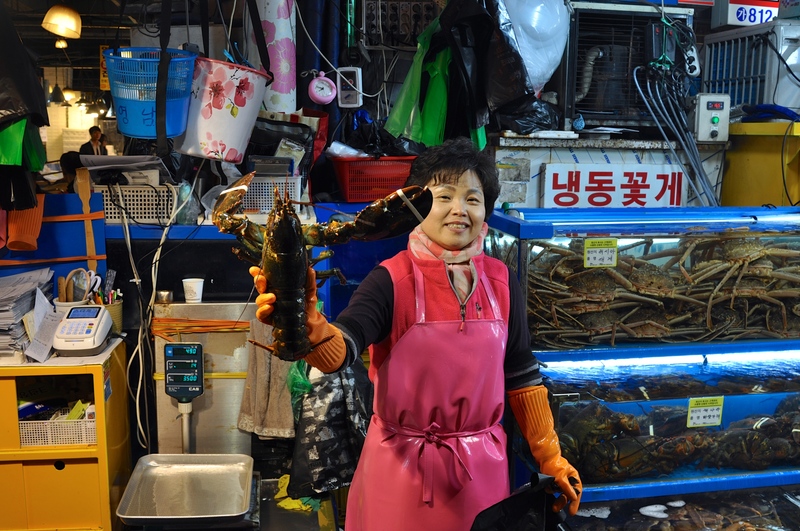 Just noticed the very scary crab things behind the Lobster Lady’s shoulder. I wonder how you carry one of them. Maybe they break the legs off for restaurant transfer, and then pick foreign tourist off the floor. Do young people re- read things, or is it a retirement characteristic ? Ah, yes. Truly worrying things, those crabs. 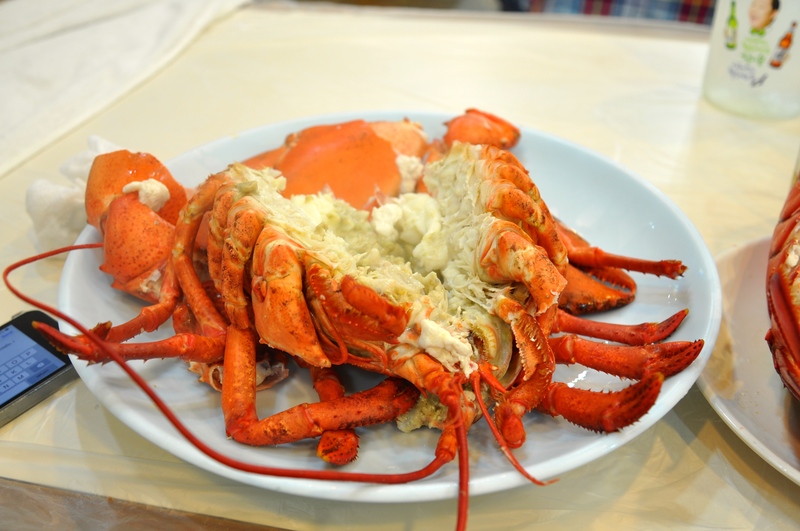 Often wondered how you’d deal, cooking-wise, with a Macrocheira kaempferi – the true Japanese monster crab. http://en.wikipedia.org/wiki/Japanese_spider_crab . A couple of girls were eating one at the restaurant at which I was. I think they ate it raw. This I deduce from the fact that it kept trying to scuttle away.